Richard Matthews, Vice-President and Electrical Engineer for Ropak, was “arrested” by a Morgan County Sheriff’s deputy on April 3rd. No, he did not commit any crime. 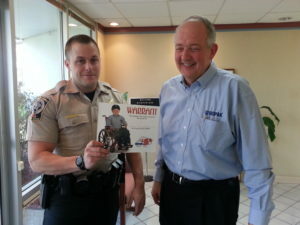 He was “arrested” and taken to “jail” as part of a fundraiser for the Muscular Dystrophy Association. As “bail” was posted by family, friends, and coworkers, he was able to produce enough money for an affected child to go to a special summer camp this year. Ropak is happy to contribute to worthy causes and to the community!